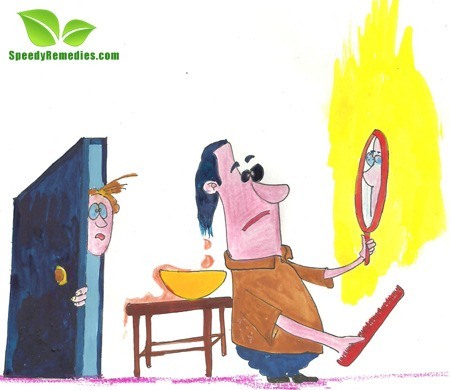 Oily hairs are due to oily scalp as the hair wick away the excess oil from the scalp. This type of scalp is generally called oily scalp by hair experts. But with some natural home remedies for oily scalp you can beat this problem. There are sebaceous glands present in our scalp which produce sebum i.e. oil, which gets accumulated over the scalp leading to oily scalp. 1. Thousands of people battle the same problem every day and fixing it with some home remedies may be easier than you think. 2. Lemon juice is a terrific solution for an oily scalp as it reduces the oiliness. You can use lemon juice for massage as well as for rinsing when mixed with water. 3. You can also use apple cider vinegar for washing your hair for oily scalp home treatment.Here’s a video showing how to wash your scalp with some ingredients from the kitchen. 4. Tea being a good astringent can help in reducing the extra oiliness from the scalp and hence help in healing this problem. 5. Another recommended home remedy for oily scalp is the use of tree tea oil. 6. Apply some egg white on the oily hair for 45 min. This will help in cleaning the scalp. This is an effective tool to cure your oily scalp. 7. Keep your body hydrated by drinking plenty of water. 8. Intake of fresh fruits and vegetable is preferred over fried and fatty foods. 9. Eucalyptus essential oil regulates the activity of the sebaceous or oil glands preventing the secretion of oil. This is one of the most effective home remedies for oily scalp. 10. To soak up excess oil, sprinkle some cornstarch, sandalwood powder or baby powder on your hair, leave it for about five minutes and then brush it out. > Never wear a tight fitting cap in summers. > Always wash your hair with lukewarm water. > Brushing of hair frequently must be avoided. > Do not use detergent based shampoos. > Massage your scalp regularly. Having an oily scalp can be quite irritating, but one can get rid of it with the above simple home remedies and natural therapies.